Roundtables are an occasional feature on Hockey in Society. Roundtables will present brief commentaries from Hockey in Society contributors on pressing or timely issues within hockey and its culture, with the aim of presenting a diverse range of critical viewpoints on the topic under discussion. The Olympic Games are, despite the Olympic Movement’s laughable claims about the separation of sport and politics, highly political events. Sometimes this politicization is obvious (e.g. Berlin, 1936; Mexico City, 1968; Moscow, 1980; Los Angeles, 1984; etc.) and other times it is more subtle – but every Olympics is hosted, supported, and contested by various actors seeking diverse political aims. This year’s Winter Olympics, currently ongoing in Sochi, Russia, is one of the more overtly politicized Games in recent memory. 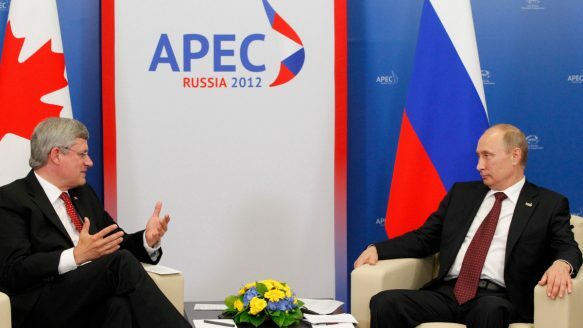 Among the controversial political issues surrounding these Games are Russia’s introduction of repressive anti-gay laws, the massive hosting costs of over $50 billion dollars and the related allegations of corruption, the security concerns over terrorist attacks, President Vladimir Putin’s use of the Games as an empire-building exercise, the culling of stray dogs from Sochi streets, and the exploitation of labour in the construction of venues. And this does not even touch upon the sports themselves, supposedly the raison d’être for the Olympic Games! Given the many complex and controversial sociopolitical issues surrounding the Sochi Games – and given the prominence of hockey as a marquee event at the Winter Olympics, as well as a form of soft diplomacy by Putin’s regime – it is timely for Hockey in Society contributors to weigh in on a variety of hockey- and sport-related topics. After the jump, five contributors share their views on a diversity of topics: LGBTQ rights at the Sochi Games; the hockey-related political machinations of Putin and Canada’s Stephen Harper; Canada’s increasingly hypercompetitive emphasis on its Olympic medal haul; the Games as an opportunity for hockey to evolve; and the question of whether women’s hockey will remain on the Olympic program. * A version of this essay appeared on The Rabbit Hole in August, 2014. In an ideal world, the Olympics are supposed to be apolitical. That in ancient times, warring nations would put aside their weapons, their feuds, and their ideological differences in order to celebrate the unifying nature of sport. . . . No political issue, no matter how jarring, offensive, or downright inhumane it may be supersedes that ideal. To that I ask Patrick, where were the women of the original games in 776 B.C.? Ah, that’s right. Women weren’t allowed to participate until the Paris games in 1900. And who dominates the Olympic podiums? The same countries that pretty much dominate the world economically, you say? What a “coincidence.” So let’s stop pretending that the Olympics was founded on an apolitical agenda because the politics of the time didn’t even consider women worthy of consideration. The Olympics were statements of political dominance then just as they are now. Russia is allowed to have whatever laws it pleases, for the most part. That’s the point of sovereignty. No one has to agree with those laws but we shouldn’t be surprised that they don’t really give a F*** about what the world thinks either. I don’t really think that Russia is to blame for this whole debacle; I think we should be pointing the finger at the IOC. It is the IOC’s job to vet potential host cities to make sure that they are not only economically suitable but also socially. It is their job to find a host that represents the ideals that they want to put forward, rather than choose the highest bidder or the city with the best night life. Russia’s anti-gay law may be newly imposed but that doesn’t mean that the culture of hate is new. Russia is and continues to be a ‘traditional’ nation that has been slow to progress on issues of immigration, sexuality, and disability etc. Therefore, to choose a host city and country that neither welcomes LGBTQ athletes or has the physical infrastructure in place to accommodate Paralympians should bring into question the accountability of the IOC. Some cities might use the Olympics (and other mega-events) to catalyze themselves into a more progressive state in order to be seen as part of the ‘world stage’ but unless certain expectations are made explicit in the host agreement the IOC has created both the rock and the hard place. So if we can agree that the Olympics has and always will be a site of political tension then let’s use it to our advantage. I think sport has been a more powerful vehicle of politics than it has at abstaining from such discussions. Every game and event represents labour relations, statements about class, gender relations, nationality, issues of race and sexuality, displays of physical ability versus disability. And what are those historic moments that we bring up time and time again? Championships are only remembered by the winning and losing parties but the stories that are passed from generation to generation are the stories of Billie Jean King beating Bobby Riggs in the “Battle of the Sexes”, Tommie Smith and John Carlos’ 1968 salute to Black Power, the 1995 Rugby World Cup that followed the fall of South Africa’s apartheid, Oscar Pistorius’ ability to compete with and against “able-bodied” athletes (let’s just look at Pistorius the athlete…). These are defining moments where sport has used its inherent political tensions to its advantage. Yes, sport often exacerbates racial, ethnic and nationalistic tensions etc. Yet, I think sport proves its worth and excels not when it shies away from political discussions but when it embraces them. Sadly, The Nation has reported that LGBT activists have already been arrested for quoting the Olympic charter, but let’s see what the athletes can do. Fingers crossed for a historic moment in Sochi that students of all disciplines will be able to look back on as a defining moment for human rights. Hockey is at once a complex game and an empty signifier. How you see it depends on how and why you look. I, as a reader of the game, prefer to consider it closely, to perceive the broad strokes, but also to notice how a game’s multitude of small, semi-random events can turn its larger course. But I am not the leader of a nation. Leaders of nations may privately love the game as I do, but publicly they have different aims. Last June Stephen Harper told reporters that the G8 was really “the G7 plus one.” The odd leader out in Harper’s reckoning was Vladimir Putin, who at the time was stubbornly supporting, and arming, his allies in Syria. This was all a part of a deadly serious, tragic and complex diplomatic game that is still far from sorted out. Both leaders were treating it as such, for better or worse. Few leaders, however, are anointed based on their mastery of complex situations. So a leader does not use hockey to explain complexity, even if it could be used that way (a bouncing puck can help explain so many uncertainties). Instead, they empty it of subtlety and fill it with a version of national pride, vicariously bolstering their own image in the processes. Thus, we see Stephen Harper rhetorically exiling Putin from the G8, while Putin reportedly called Harper a “Trotskyite,” for “exporting revolution” to Libya. This is all a part of that complex diplomatic dance. Meanwhile, on the simplistic-propaganda level, both leaders use the game to promote national glory. Putin gears up in Army red to “try out” the new Sochi rink, and Harper pens his history of the game (while his chum Don Cherry continues to push his own ideology through Coach’s Corner). Harper was Prime Minister when Canada won gold in Vancouver. Now the Russians get the chance to win it at home for Putin. Two leaders, periodically at odds. One game, complex if you look hard, or propaganda if that’s what you’re going for. Both ways of watching, or using, hockey will be in play this Olympics. I’m typically not a follower of sports that are showcased at the Olympic Games, but like most Canadians, I’ll be closely following the hockey tournament. The actual Olympics and the governing IOC are difficult for me to take seriously, mainly because of the absolute corruption that underlies its operations. It’s a big business rife with scandals, controversies and politics, making it difficult to support. Having said that, once you mention an international hockey tournament featuring the best in the world, my cynicism of the Olympics is replaced with some excitement at the thought of quality, meaningful hockey being played at the world stage. Keep in mind, I’m an Oilers fan, so competitive hockey isn’t common for me to see. It’ll be great to see Canada dominate the competition on their way to another gold medal. But what I really want to see is the game evolve from what it is today. That might mean another, less favored nation winning the gold or a non-Canadian coach or player standing out. There is far too much to not like about the game today and the Olympics could help push for changes to current team tactics. Regardless of the final tournament results, I hope to be reminded of what the game is meant to be: a fast paced, high quality product, with emphasis on skill and physicality without the pointless fighting and sideshows. We may not win the medal count this time, we may not win it next time but one day we will, because we are striving to be number one in the medal count. This statement seemed to have specific culture resonance if you consider it against the exceptional status regularly afforded Hockey Canada, and the Men’s Olympic team in particular. By exceptional status, I’m referring to the fact that the Men’s Hockey team (i.e., Crosby et al.) can’t really be considered Olympians in the same way as your average ski jumper or biathlete (and the fact that I can’t name a single member of this year’s Canadian biathlon team confirms this, if only in my own head). But I’m also referring to the fact that it’s officially now (or has it always been?) “Gold medal or bust” for our three hockey teams (Men, Women and Sledge). If any of these three teams come back without a gold, they will have failed, and there aren’t many other Canadian Olympics staring down that barrel of pressure while in Sochi. But maybe they all will in future, if Podborski has anything to say about it. So, attention all up and coming Canadian ski jumpers. If you always wanted to be a famous hockey player, you might get your wish. Sort of. Women’s hockey debuted at the Olympics in 1998. In the four Winter Olympics since then, the US and Canada have met in the tournament finals at every Games – with the exception of 2006 when Sweden shocked the US in the semifinals, before settling for a silver medal after losing to Canada in the final game. After four Olympics, the medals have remained in the hands of just four countries: Canada (three Golds, one Silver), the US (one Gold, two Silvers, one Bronze), Sweden (one Silver, one Bronze), and Finland (two Bronze). At each Games, it is all but a certainty that the Gold Medal game will be played between the two North American powerhouses and the rest will be left to fight for Bronze. The IIHF and IOC are attempting to improve the quality of play at the Sochi Games by restructuring the tournament. The top four nations (US, Canada, Finland, and Switzerland) are competing in pool play and are each guaranteed a place in the next round. The bottom two teams from this group will play the top two teams from a second pool, which features Russia, Sweden, Germany, and Japan. The winners of these games will each advance to face, presumably, either Canada or the US in the semi-finals. This format has the advantage of both ensuring more competitive games for lower-ranked teams and, because goal differential will no longer be a key factor in determining standings, avoiding blowouts by superpowers over lesser teams. Despite these changes, some commentators feel like this tournament could be the end of the road for women’s hockey at the Olympics. Fasel, however, is confident in the sport’s Olympic future. The level of competition has been decent so far, though the US (two wins, 12-1 goal aggregate) and Canada (two wins; 8-0 goal aggregate) are still winning comfortably. It seems all but a formality before the US and Canada meet in the Gold Medal game for the fourth time. Will this lead to another discussion about the future of women’s hockey at the Games? The plodding growth of the women’s game in Russia isn’t merely a question of allocated resources. Russian sport remains highly patriarchal. The country . . . still prefers to see its female athletes participate in tennis, gymnastics and figure skating, rather than sports like hockey and soccer. This is not just a Russian problem – despite the success of US and Canadian women’s programs, their sport remains very much on the margins compared to their male counterparts. I have written elsewhere about the lack of media coverage afforded women’s hockey outside of the Olympics; this, and the lack of a legitimate professional league, hinder the opportunities for many women to succeed in hockey. A professional women’s league that welcomed players from around the globe – thus allowing the best from Japan, Russia, Sweden, China, etc. to compete alongside top North American players – would seemingly help develop, in tandem with improved local systems, the elite players in minnow countries. But achieving parity and encouraging excellence in women’s hockey will also require a constant struggle for equity and acceptance for female players – and this, of course, is a much more challenging task. Let’s hope that Fasel’s optimism is not misplaced. For many reasons, it would behoove the IOC to keep it on the program and the IIHF to continue to allocate resources toward increasing opportunities for women around the world to play the sport in supportive and equitable circumstances.